Notes | After spending more than thirty years behind the lens—working for National Geographic, Time, Life, and Sports Illustrated—Joe McNally knows about light. He knows how to talk about it, shape it, color it, control it, and direct it. 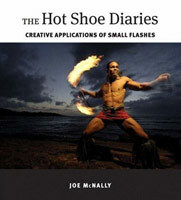 Most importantly, he knows how to create it...using small hot shoe flashes. Joe McNally is an internationally acclaimed American photographer and longtime photojournalist. His most notable series is "Faces of Ground Zero—Portraits of the Heroes of September 11th," a collection of giant Polaroid portraits. He also photographed "The Future of Flying," the first all-digital story for National Geographic. His award-winning work has appeared in numerous magazines and, in 2008, Joe wrote the critically acclaimed and bestselling book The Moment It Clicks. Comments | [10/28/09] This is an amazing book. It has inspired me to do many different things with off camera flash. I consider myself a follower of Joe McNally-ism. This definitely gives you the theory into light and opens new doors for you to try new things! A definite recommendation! Comments | [07/01/09] Had this on my to buy list at amazon -my wife got it for me for fathers day- Great book , well organized with plenty of examples of small light solutions to about any situation you may have. A must have book!!! Comments | [06/15/09] One of the only "Strobist-style" books out there, doing a wonderful job of breaking down the use of small speedlite flashes to get unique photo on a budget. The language is a bit thicker and more technical than "The Moment It Clicks," but that is to be expected.